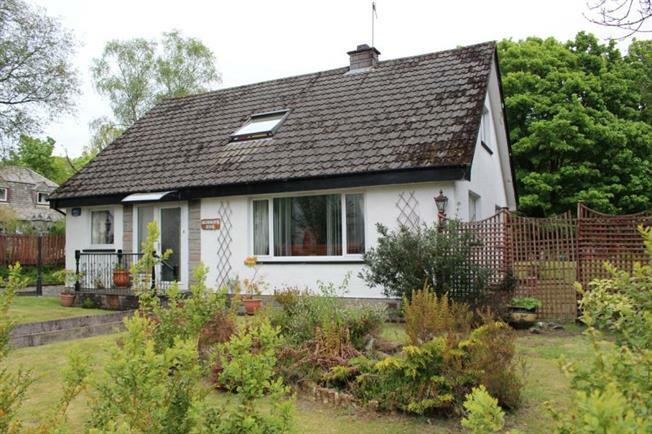 4 Bedroom Detached Bungalow For Sale in Helensburgh for Offers Over £205,000. Creachan Mor is an individually built, impressively proportioned detached villa nestling towards the head of this desirable no through road. Set within a generous, well stocked and maintained garden, which backs directly onto designated green-belt, this deceptively spacious family home provides a versatile layout and has been appointed to a good standard. Complemented by upvc double glazed windows, access doors, craftsman fitted wardrobes, well equipped kitchen and gas fired central heating, the property is well placed for access to Garelochhead's numerous amenities, with the reputable primary school, health centre and bowling club located within a third of a mile from the property. The accommodation comprises: double glazed entrance porch, reception hall, near 20' lounge with double aspect window, family / sitting room, dining room with double aspect windows, down-stairs bedroom, quality fitted breakfasting kitchen and tiled shower room with mixer shower room. A broad staircase leads to the master bedroom (with ensuite bathroom - incorporating shower enclosure) and further two double bedrooms (two of the bedrooms offer quality fitted wardrobes). Providing a protected environment for young children, the gardens feature a sun deck, single garage, garden shed and chipped driveway offering of road parking for three cars.